The energetic spinning of the anti-Russian line by Washington is going too far, author and expert in political and military affairs Brian Cloughley notes, warning that the damage will be long-lasting. US Assistant Secretary of State Victoria Nuland has obviously achieved her dream of state-building in Ukraine: her protégé Yats (Arseniy Yatsenyuk) is serving as Ukrainian prime minister, while boxer Klitsch (Vitali Klitschko), a Mayor of Kiev, is cracking down on anti-government protests in the Ukrainian capital, former Australian defense attaché to Islamabad, author and expert in political and military affairs Brian Cloughley underscores. The author cited Victoria Nuland's infamous telephone statement made on the eve of the Ukrainian coup of 2014 that said: "I don't think Klitsch should go into the government. I don't think it's necessary, I don't think it's a good idea… I think Yats is the guy who's got the economic experience, the governing experience… what he needs is Klitsch and Tyahnybok [Oleh Tyahnybok, leader of ultra-nationalist VO Svoboda party] on the outside. He needs to be talking to them four times a week, you know." 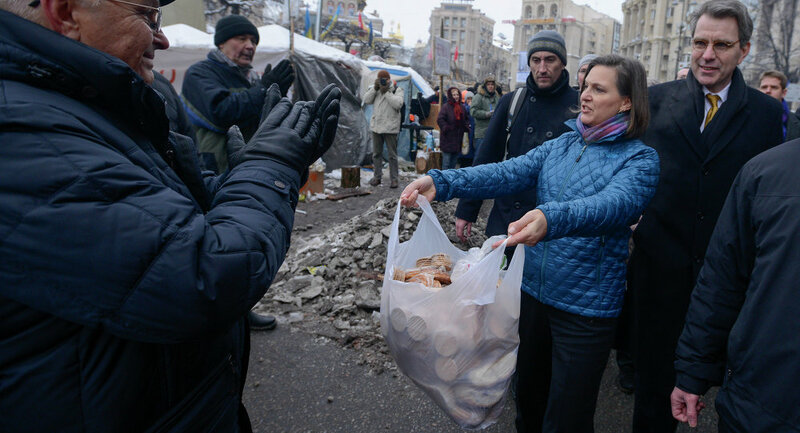 "This was Nuland's — and America's — model for 'democracy' in Ukraine, and they thought it right that those appointed by the US-selected President Poroshenko should also be approved by Washington. Which they were. And one wonders from whom they now take their orders," Cloughley pointed out in his article for Strategic Culture Foundation. On the other hand, Washington is obviously demonstrating Orwellian Doublethink by turning a blind eye to recent anti-government protests in Kiev. Although widespread discontent with the Yanukovich administration led to the US-backed coup, the latest protests in the Ukrainian capital are not viewed by the West as a "convincing argument" for the replacement of the government. "[A]fter the recent riots and killings outside the parliament in Kiev there were no western pundits declaring that these disturbances should result in western-supported replacement of the present government," the author pointed out. 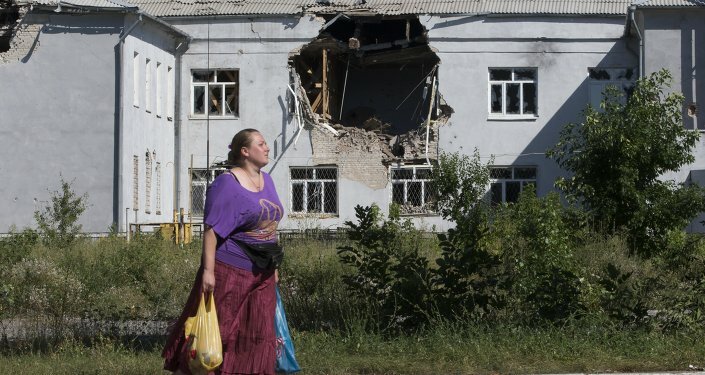 Ukraine's anti-Russian stance is evidently playing into Washington's hands. Arseniy Yatsenyuk's ludicrous attempts to re-write the history of the Second World War and accuse Russians of "invading" Ukraine do not annoy Kiev's American patrons. "[T]ruth does not satisfy the supporters of Ms Nuland's Yats, any more than it pleases Ms Nuland herself, and there was never any attempt by the West to set the record straight," Cloughley remarked. Furthermore, Washington is only adding fuel to the fire by declaring Russia an "existential threat" to the US and Europe. The US' absurd anti-Russian sentiment as well as Obama's provocative statements regarding America's "indispensability" indicates the White House's immature approach to international relations. "This immature approach to international relations has become the hallmark of administrations in Washington and although regarded with hilarity by many millions around the world is nonetheless patronizing, supercilious and offensive — and potentially dangerous, because it whips up national belligerence which is in turn manipulated by those such as the demented Trump, who just might become the leader of the 'indispensable nation'," Cloughley stressed. The expert warns that "the energetic spinning of the anti-Russian line" will bring no good to the US, while "the damage will be long-lasting." However, Washington hawks believe there is nothing to worry about: despite whatever fruit the US policy in Ukraine bears, America's wealthy investors will prosper "from the wheeling and dealing of Yats and his friends."